Our story begins in the basement of a church that housed a preschool I was considering for our son Ryan aged 5 and our daughter Devon age 4. I was scared. I was hating the fact that I had to send them out there into the world. Who would take care of them? How would they be loved during the day? Will they be safe? However, nestled in the small rooms of the church basement, I saw little ones grinding millet to make muffins, the first graders were knitting in class and the second graders proudly displayed their hand embroidered bags that were hung on hooks across the back of the classroom. I stood there in the doorway and I cried. This, this felt like love. These nurturing, creative activities were what I wanted for my kids. Visions of teachers lovingly guiding them, made me feel safe, that they would be ok, that I would be ok. Though we were only at this school for two short years, my years of corporate experience started churning the wheels in my head. I imagined that if I loved these kinds of activities and this kind of warmth for my own children, that other mothers must want the same thing too. So after we left the school, I took the best part of it with us, handwork, and I test marketed the idea at my kitchen table. I hired an amazing teacher, invited the neighborhood kids to take handwork classes and our business began. Today our business reflects over a decade of mixing childhood development with the wants and needs of parents and kids. As a parent, I want our families to feel all those things I felt standing in that schoolroom doorway so many years ago. We hire amazing instructors who are happy spending the day crafting with your kids. We focus on making your children feel good about themselves, feel that they are cared for during classes and camps and that their work matters. Hugs and giggles are part of our daily routine. Our curriculum of classes, camps, parties and workshops are designed with your kids in mind. We focus on creativity and accomplishment, not perfection. We pick projects that are on trend, fun and kid approved. 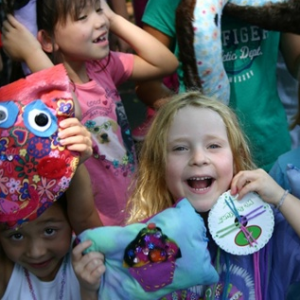 For the summer of 2015 we continue to be headquartered just outside of Philadelphia in Narberth, PA and will be in over 40 locations in 8 states, bringing our brand of needle arts fun to over 2,500 campers. Please visit our Blog so you can get a sense of what we are about. If you have any questions, please Contact Us and Miss Ana, our Studio Administrator will be happy to help.